Minor League Baseball wacky names: Can you ace this quiz? 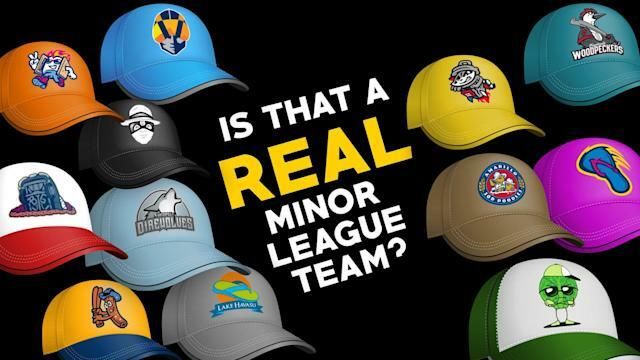 Take the quiz: Is that a real or fake Minor League Baseball team? You may not need us to tell you this, but Minor League Baseball teams have some pretty crazy names these days. Between the everyday weird names (hello, El Paso Chihuahuas) and the ever-growing list of short-term alter egos (hello, Hickory Llamas), there is no shortage of unbelievable team names. For the third year, I went to spring training and asked baseball fans whether they could tell the difference between real minor-league teams and ones that I made up on my flight to Arizona. And this year, many fans decided that the weirder the name is, it’s probably true. They’re mostly right too. So here, for the third time, is our annual spring training quiz: Is That a Real Minor League Team? If you’ve missed the previous installment of this series, here they are: Vol. 1 | Vol. 2.